Join your local host Junko in her kitchen for an authentic hands-on cooking experience! You will learn to cook 3-4 of Junko's favorite, savory Japanese dishes made from seasonal ingredients. 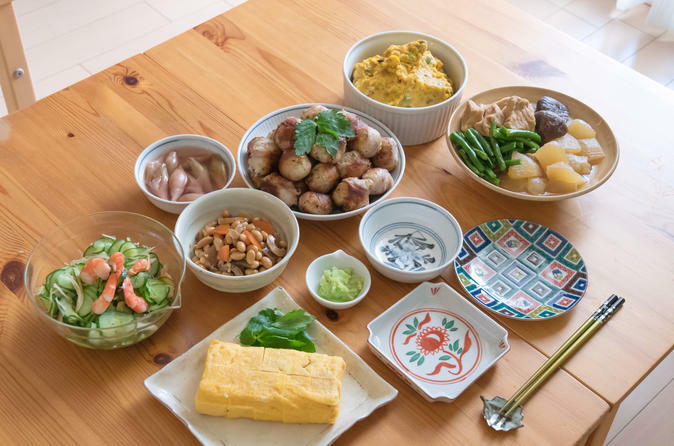 Some dishes you might prepare are a Teishoku style meal of a main, rice and soup alongside delicious sides or traditional nimono (slow-cooked vegetable and meat stew). You can expect your cooking class to take about 1.5 hours before you and Junko sit down together on the floor in front of a low Japanese style table to share the meal you helped prepare. Don't miss out on this wonderful opportunity to immerse into Japanese culture and cuisine with a welcoming local! Join Junko in her kitchen and enjoy creative and seasonal Japanese cooking!